Every so often our wonderful local theatre makes the news. One such occasion was a couple of days ago, when I got an excited phone call from Mrs Chrisparkle on her morning drive to work (hands free, naturally – the phone that is, not the steering wheel) saying “Turn Radio 4 on!” And there was the redoubtable Jim Naughtie talking about the World Premiere of an Arthur Miller play in little old Northampton. 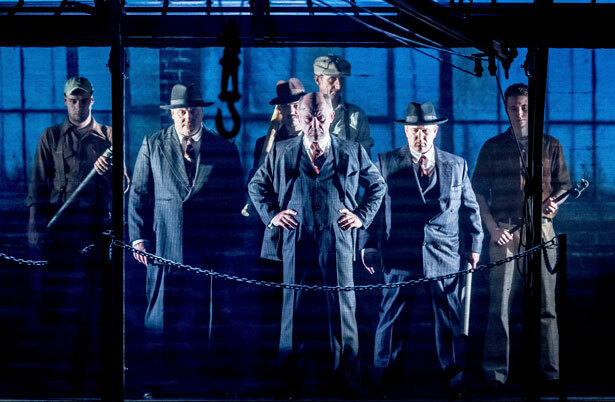 Certainly a contender for the greatest American playwright of the 20th century (Arthur Miller that is, not Jim Naughtie) – maybe even in the world – this joint production between the Royal and Derngate and the Liverpool Everyman and Playhouse is a major theatrical event. Who even knew Miller had written something that hadn’t yet been performed? 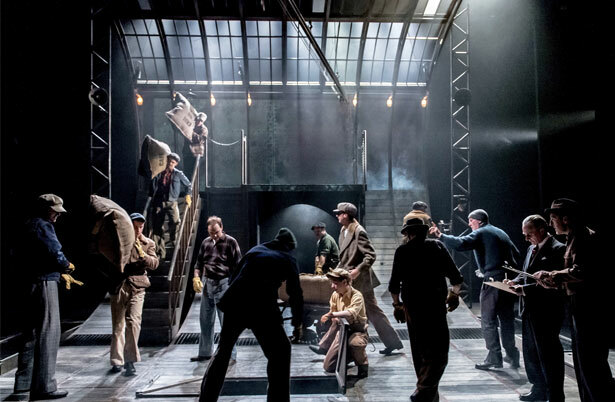 The programme (which I really recommend) has two very helpful articles about how the production came into existence and about Miller’s background and association with the longshoremen of New York. Miller had originally written The Hook as a screenplay and offered it to Hollywood, but they wouldn’t touch it with the proverbial bargepole unless Miller rewrote the characters to make the union members into communists. 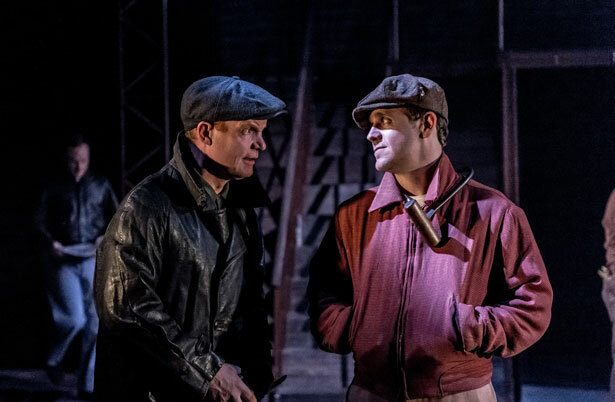 Miller refused to back down; Hollywood refused to take it – On The Waterfront appeared instead; and thus it sat, mouldering in a drawer somewhere, unloved and unproduced. Director James Dacre and designer Patrick Connellan have done extensive research over a number of years, discovering all Miller’s drafts (I’m sure that’s a euphemism for drinking Canadian beer), collating as much raw material as possible for playwright Ron Hutchinson to come up with a theatre adaptation that’s intense, hard-hitting, with a few meaty roles, and that tells a story from the heart. That story concerns one Marty Ferrara, a decent, honourable man who works as a longshoreman in New York and who fights against what he sees as the rotten, corrupt nature of the union and the employers, who turn a blind eye to the dangerous conditions in which the men have to work, pay lip service to their rights, and are happy to rip off the men at every opportunity. Marty’s wife Terry wants him to be happy and to be true to his own integrity, but at the same time she needs him to earn money as otherwise the whole family will be destitute. Marty’s angry struggle takes him through some very bad times, including attempts made on his life, and culminates in his standing for Union president in a rigged election of which Kim Jong-un would be proud. Why The Hook? Well it takes place in Red Hook, Brooklyn – where Miller was born, and each of the men working on the piers has his own hook tool which he uses to help lift and move the containers they are unloading. But other hooks are also at hand. Each man is hooked, so to speak, to the docks as his only means of income, and if anything threatens that dependency, like electing a new, agitating union leader, that hook just gets stronger. In the end, Marty is rewarded with a union post, thereby masking the corruption of the election, and getting the union leader off the hook. Am I taking this too far? 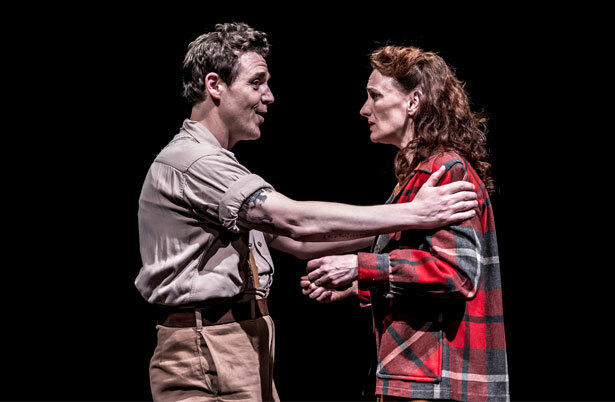 In the course of the play Miller addresses themes of loyalty, corruption, reward and democracy, creates some memorable dramatic moments and a credible story line. However, if I’m honest, I don’t think the character of Marty is invested with anything like the tragic hero potential of Willy Loman, Eddie Carbone or John Proctor. For one thing, he lives! He survives the play and presumably goes on to have some kind of life in the future – what kind, is up to the audience to decide. For that reason I felt it had an upbeat (if extremely sudden and slightly unrewarding) ending. Mrs C took a different view – she thought that Marty’s future would be spent achieving nothing, and therefore found the end profoundly pessimistic. Maybe that’s an observation about our own differing levels of cynicism. Or maybe it’s a neat Miller trick to confound his audience at the end. The production looks and sounds stunning. Patrick Connellan’s set is extraordinary and constantly reveals new capabilities through the course of the evening. It converts from office to pier to the Ferraras’ home with effortless ease. The sharp black pinstripes of the union leader and the businessman contrast perfectly with the thin and well-worn work clothes of the stevedores. The sound design by Tom Mills is amazing; tiny effects like placing a glass on a table or ominous footsteps reverberate and echo with portentous doom to create a really claustrophobic atmosphere. Isobel Waller-Bridge’s incidental music is disconcerting and brooding. But I have to confess to experiencing some confusion with the plot. Attuning to the accents meant that quite a lot of the early dialogue hit my ears but never quite reached my brain (not helped by two chatterbox young ladies to my right) and identifying and understanding some of the characters and story twists happened more in retrospect than at the time. Mrs C noted that at least two of the tables in the bar during the interval had people explaining to their friends who was who and what was happening. I think that was the trouble with the chatterboxes, as they were explaining to each other what was going on. Even today in discussion Mrs C and I realised that we still hadn’t quite worked out the relationship between some of the characters and what their actual jobs were. 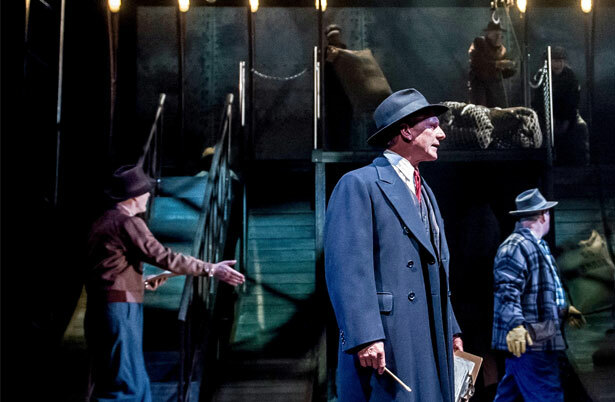 Some of the performances in the first act were also a little on the shouty side – one of Mrs C’s pet hates – although to be fair many of the characters had plenty to shout about. 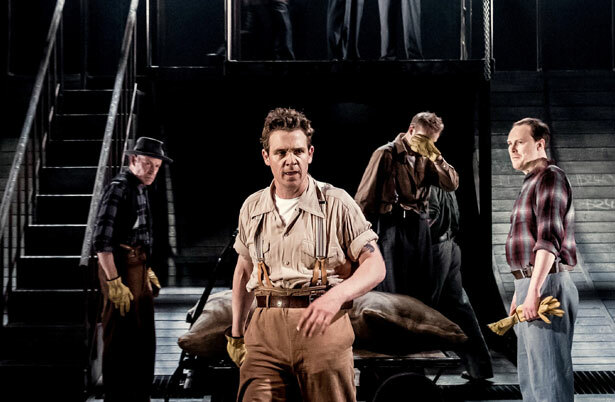 The central character of Marty is given a forceful and characterful performance by Jamie Sives, promoting the workers’ causes, a natural leader, genuinely resistant to all the pressures of corruption that surround him. 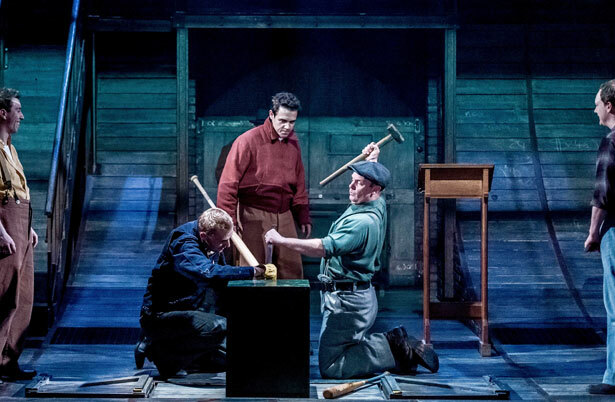 There’s a particularly moving scene when one of the men is writing in the dust on the floor, adding up a sum of how much money the union has cheated from them. Marty is so infuriated with it that he physically hurls himself into the dust to erase the offending calculation. It’s an extraordinary visual depiction of his deep need to eradicate the injustice against his fellow men, and to his willingness to degrade himself if necessary to achieve it. At the other end of the societal scale there’s a splendidly villainous turn from Joe Alessi as Louis, the self-aggrandising, pocket-lining, cigar-smoking, superiority-obsessed union leader whose choices in life depend entirely on to what extent they benefit himself. Today he would be in charge of FIFA. It’s an excellent portrayal of corrupted power. There’s an electric scene between him and Sean Murray as Rocky, where the two powerful men stalk each other mentally, looking for gaps in each other’s defence, like a boxing match disguised as a business meeting. Mr Murray nicely conveys an element of decency lacking in his opponent’s character elsewhere in the play – there’s a memorable scene at the beginning where Rocky’s henchman Farragut (a suitably weaselly performance by Jem Wall) dismissively tosses a spare coin to the floor so that the men who didn’t get work that day can scrabble undignified on the pavement for it – and Rocky cuts him down to size as a reward. There’s also a sterling performance from Susie Trayling as Marty’s wife Theresa, downtrodden yet supportive, a voice of domestic reason, but still too insignificant to him to influence his driven need to represent the working man. 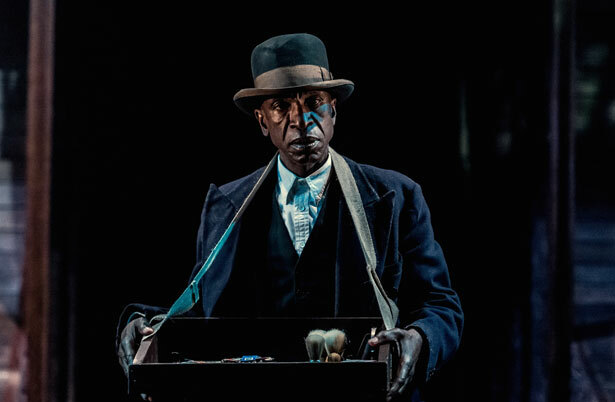 I also enjoyed Paul Rattray’s earnest and eloquent performance as Enzo, Marty’s most loyal comrade (not that they’re communists, see paragraph 2) and Ewart James Walters as Darkeyes, trying to make a measly living selling trinkets and taking bets; a modern Tiresias, the blind man who sees the truth. Miller loved a bit of Greek Tragedy in his plays, you know. The ensemble is augmented by members of the local community theatre who do a grand job of creating a sense of busy crowds and a wider society. I particularly liked the way a whole bunch of men suddenly appeared out of nowhere whenever the daily work was to be allocated by the bosses. 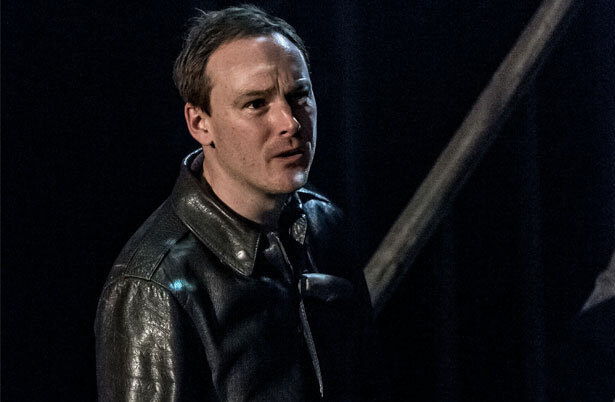 So, all in all a significant new work given a very good production, although if you’re hoping to see A View From The Bridge Mark#2 you might be a little disappointed. In the year that celebrates Arthur Miller’s centenary, this is a very welcome addition to his repertoire. 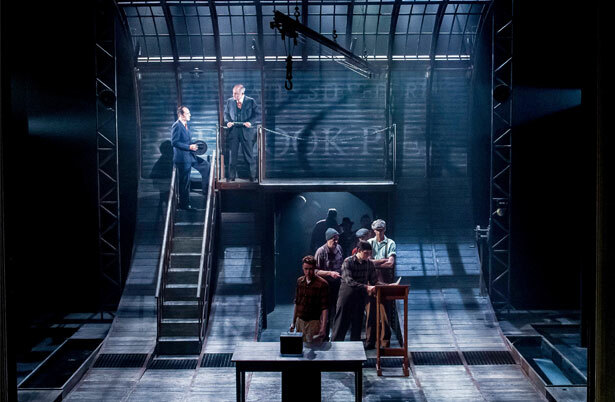 After it finishes its run in Northampton on 27th June, it visits the Liverpool Everyman until 25th July. If you’re interested in the works of Miller, this is a must-see. 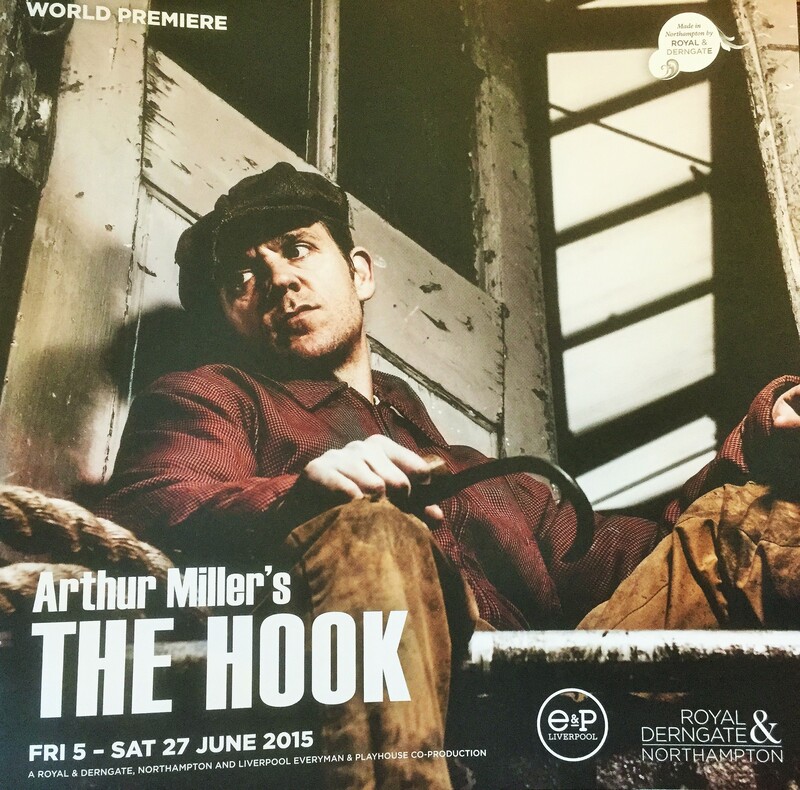 This entry was posted in Theatre and tagged Arthur Miller, chris sparkle, Derngate, James Dacre, Jamie Sives, Joe Alessi, Northampton, Sean Murray, Susie Trayling, The Hook. Bookmark the permalink.